Happy New Year! Click here to play! Wait, it isn't the New Year, yet? Oh well. Happy New Year! Still not New Year? When does the year stop being considered new anyway? Because with the Happy New Year slots, it always seems like time to celebrate the New Year. 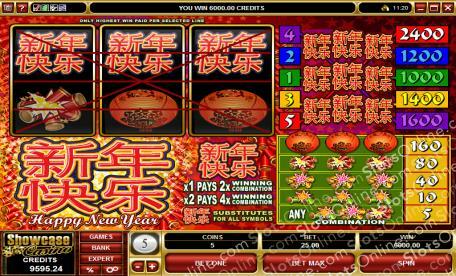 The Happy New Year slots are 3-reel classic slots themed around Chinese New Year celebrations. You know what that means. Lots of fun symbols like firecrackers, New Year lanterns, and wishes for a Happy New Year for you and your family. If you win the top prize of 2400 coins, you can bet it will be a happy year for you! Ring in a New Year with every spin and see what you can win in very lucky Happy New Year slots. Happy New Year symbols are wild and can substitute for all other symbols, as well as awarding the highest jackpot amounts. Also, payouts that use a wild symbol are increased in value. When 1 symbol is substituted, the payout is doubled. It is quadrupled when 2 symbols are substituted.